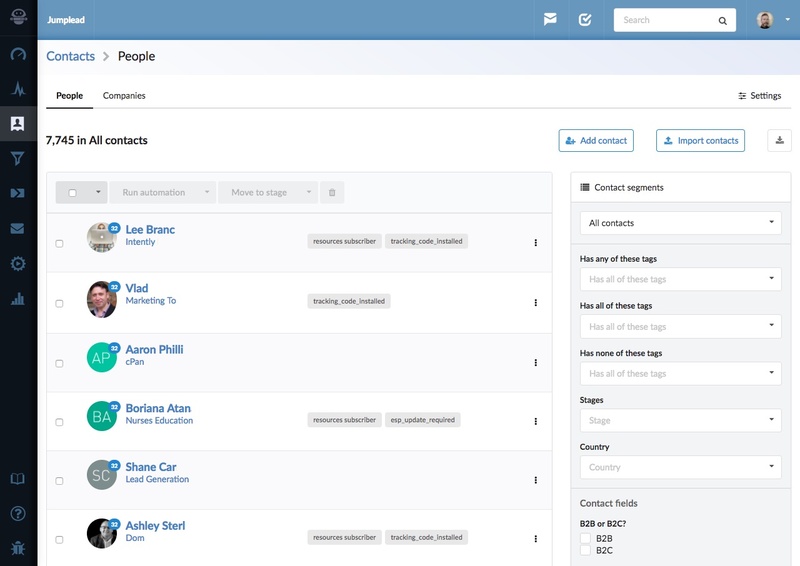 Contacts are created automatically when conversion forms are completed, further contact activity is added to the contact’s profile page and a lead score is maintained to measure their engagement. Jumplead allows you to create smart lists that define a segment of your contacts that you wish to address, for example with an email campaign. As your contacts trigger automations through their activity, such as downloading ebooks or opening emails, they can be moved between stages, have tags added or removed etc. These changes will update which lists they appear in. So you can create a segment then send an email to your contacts that are in a 'Marketing Qualified' stage with a 'B2B' tag who has viewed your pricing page for example. Contacts can also be added manually or imported using a CSV file. However, only contacts that have shared their details with you via a Jumplead Conversion Form or Landing Page can be tracked and scored completely.